The Colors Of Indian Cooking: Easy, Fast, Vegan. Can't Beat These Beets. Easy, Fast, Vegan. Can't Beat These Beets. We grow a lot of our own produce at our place here in Sonoma. Every year when it's time to plant I think about what I like to cook, what vegetables I'm always shopping for, and those are the ones I choose. We xeriscaped our property when we bought it, took out the fountain out back, and the lawns in the front and back, kept the roses, planted fruit trees and herbs and in the back put 7 large raised growing beds. What we get out of these supplies a LOT of vegetables. Everything in the garden is on a drip system which is connected to NOAA by wifi which controls water consumption, and we renovated to CalGreen standards which brings out the DoomsDay Prepper in me. Next up, a cistern and grey water system, but for now we got a whole lot of veggies with the minimum of water and lot of chicken manure. One vegetable we always grow, because we like it and it's used in so many Indian recipes are beets. 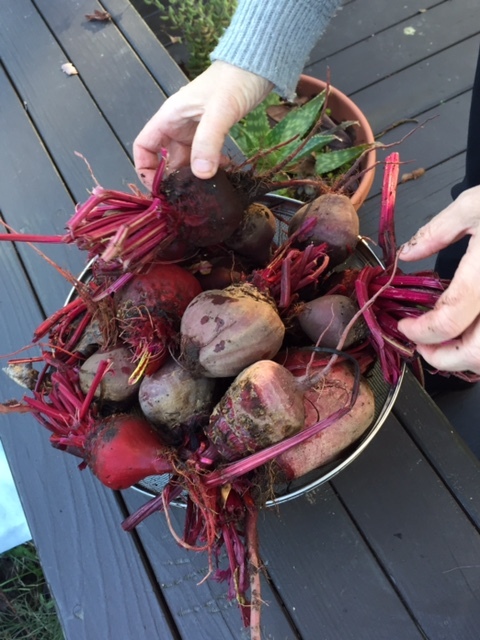 After the big storms we had last week and the ones coming/we are in the middle of this week, I harvested several pounds of beets and several pounds of potatoes. The potatoes are laid away in cold storage in the garage. Some have been separated out as seed potatoes for this springs garden, others stored for eating. The beets are going to be roasted, vacuum sealed, and frozen. But before they go into the deep freeze, we're enjoying some of them for lunch. Beets are great vegetables and I never really appreciated them until I started cooking and eating fresh ones rather then those things my mom would always reheat out of a jar. I'm a great believer that most vegetables people hate translate to "you've just been eating them wrong" meaning cooked the wrong way. That seems to work with a lot of things... except maybe okra... in my husbands' case. I did plant some two years ago but it mysteriously never came up. I don't know whether he had something to do with that or not, it remains a mystery. Beets however don't need any persuading around our house and I've got a simple traditional Indian recipe that makes cooking them a snap. 1: Wash the beets off and dry them. 2 : Trim the beet tops to about an inch. 3: Rub the beets with some vegetable oil and wrap them individually in foil this prevents beet leakage which can make ones oven resemble a murder scene. 4: Place the wrapped beets on a cookie sheet and bake them for about 45 minutes to an hour. Unwrap them a bit to check. When a fork goes into them easily they're done. 5: Either unwrap them and let them cool, to use them immediately. Or keep them wrapped and cool them on the counter then place them in the fridge overnight for use the next day. Now that the beets are roasted here's what's next. WARNING: These beets are going to leak either way the minute you cut into them, so I usually use surgical gloves that one can get at any drugstore when working with them. I have a box of them for culinary use for beets and chilies. Cut the tops off the beets. Cut the bottom off the beets. You can at this point slip the skin off of them with a paring knife or just trim it away easily. Cut the beets into small cubes, about 1/2 inch. Get your spices ready, because this dish cooks up pretty fast once the beets are roasted. In a skillet or kadhai heat the vegetable oil. When the oil is hot toss in the mustard seeds and the curry leaves if you are using them. When the mustard seeds start to pop and the curry leaves sizzle toss in the beets. Turn the heat down to medium and add in the turmeric. Stir it around well, then cover the pan and let things cook for about 5 minutes. Take the lid off, give things a good stir and add in the salt and chili. Keep the lid off the pan and cook for another 5 minutes or so. You want to make sure everything is well blended and nothing is sticking or burning, so give it a good stir every now and then. When the beets are nice and tender, they're good to go. Take out the curry leaves and dish them up. I have several of these tiffin boxes which fit perfectly into my bike basket for an Indian picnic... HOWEVER, since it was pouring rain outside we just ate in the kitchen. They're mighty cute little boxes though.